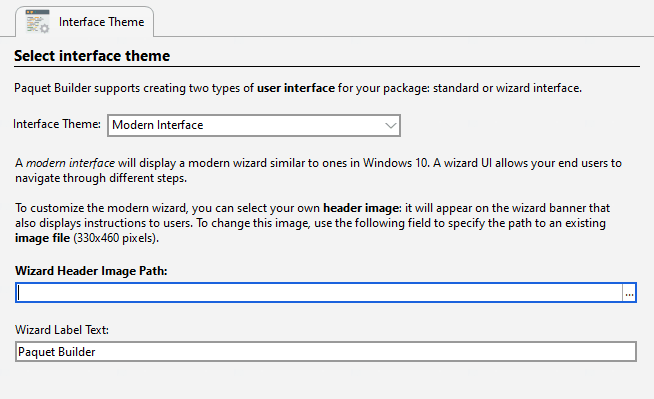 Change images and icons of the packages you build. You can use your own bitmaps and therefore display what you want to end users. Ask end users for the Start Menu Folder where shortcuts to your application should be placed into. Optionally display a billboard image when extracting files. You can advertise your product, company or website. Optionally show a progress meter bar during the file extraction process. You have the choice between several pre-defined progress meter bars, including wizard-styled progress bar. 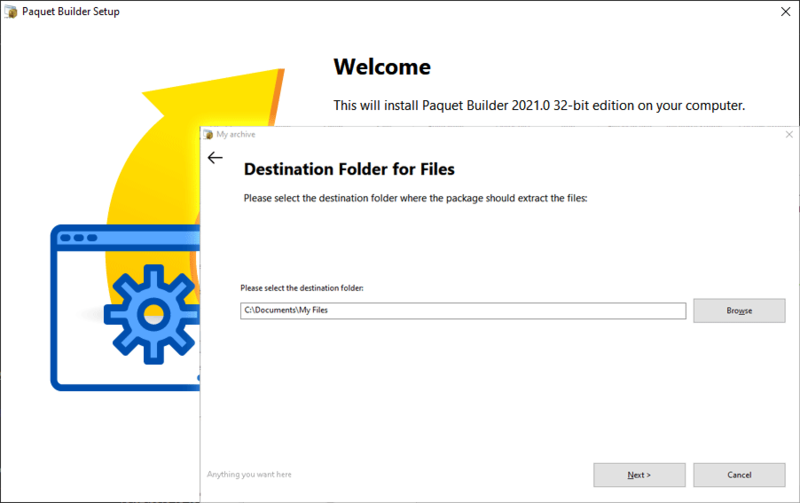 Paquet Builder can generate silent packages that extract their files with all dialogs hidden (without any user interaction). 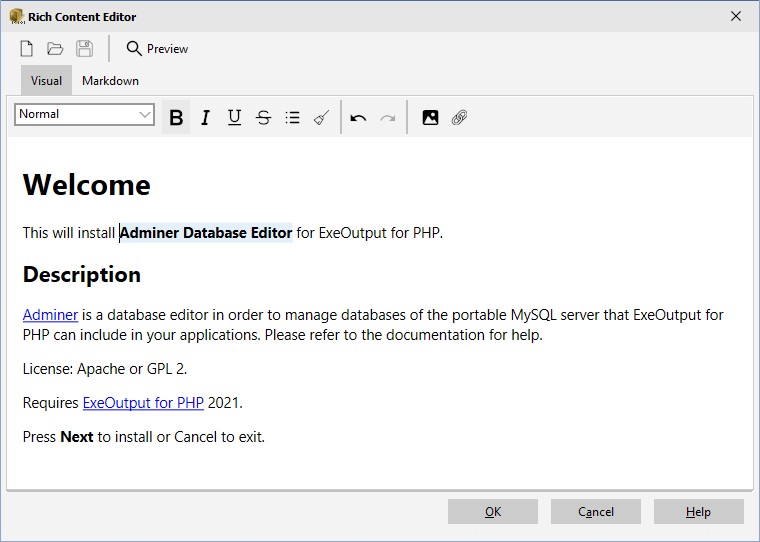 Ability to overwrite, skip existing files or prompt end users for overwriting (with support for file dates). Optionally you can check for version information using custom actions. Possibility to display a standard "Welcome" step with your own rich text in wizard packages. Displays customizable prompt and message boxes at any time. Ability to show unlimited "Read Me" or License Agreements at any time (without size restriction unlike other SFX tools) in Rich Text Format. Moreover Paquet Builder includes a built-in RTF editor (Rich Text Pad) which lets you directly edit your rich texts without needing any external tool. Define the name of the executable package (also its title). No self-advertisement is made on user's screens. Specify your own custom icon for your package and uninstaller (these icons are displayed in Windows Explorer). A set of icons is shipped (.ICO files). 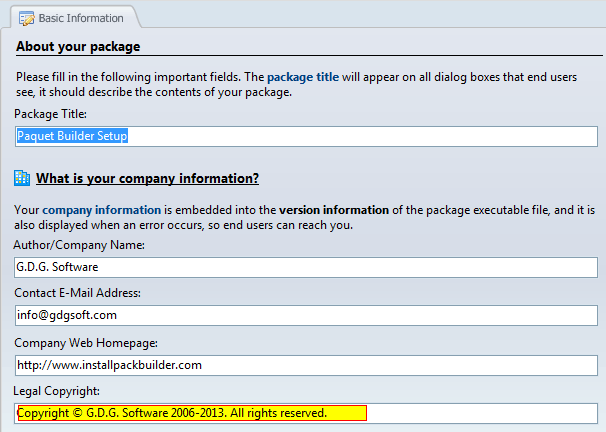 Integrate your own copyright text, file description and/or web homepage in the version information resource section of the created executable file.